Let’s take a walk back down memory lane and see the dramatic transformation we made on the exterior of our first fixer upper. 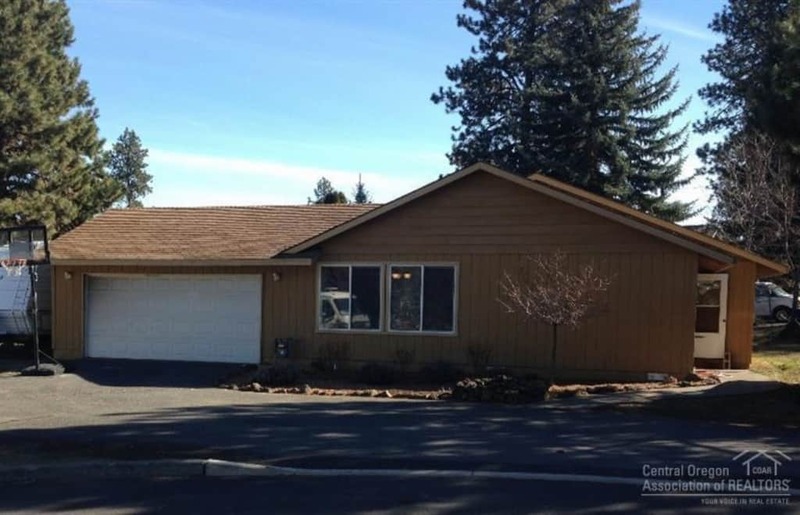 Come along for this exterior picture tour as we look at our house makeover with before and after pictures of our exterior renovations. 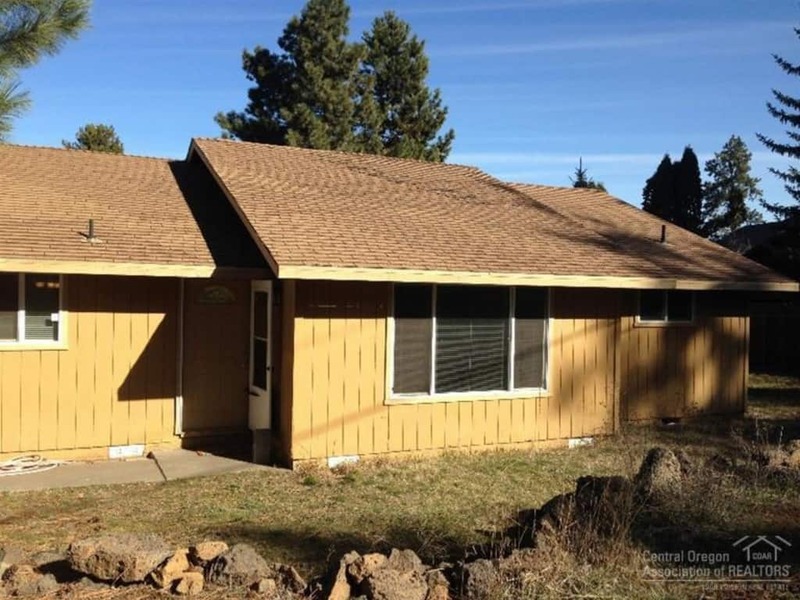 A few months ago we moved into our 2nd fixer upper. We’re so excited to get started on renovation projects, organizing and unpacking and, of course, decorating. 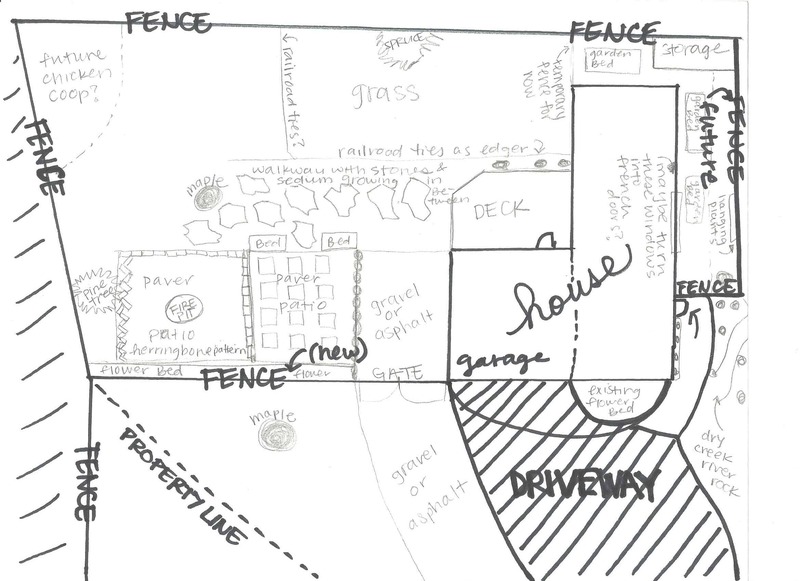 You can read more about our full renovation plans for the new house here. But before we completely move on to talking exclusively about the new home here on the blog, I thought it would be fun to take a little walk down memory lane and show you the dramatic transformations we made with our first fixer upper! 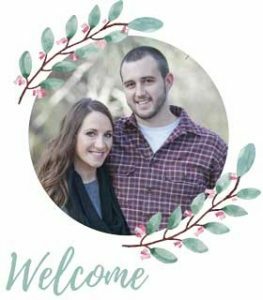 There were a lot of things that we never ended up sharing on the blog, so today starts a two part series giving you a detailed look into our house makeover! We’re starting the exterior renovations first. 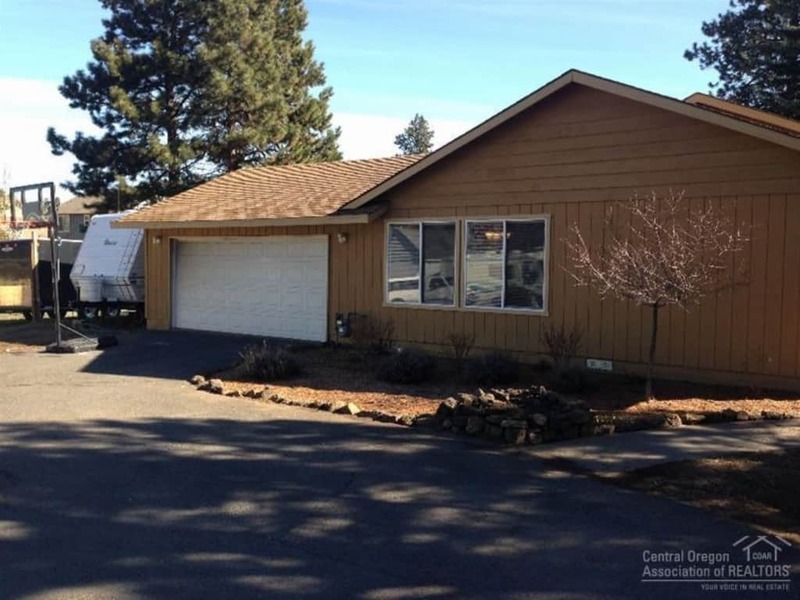 Let’s start with the first thing you see when you drive up to the house…the front of the house! 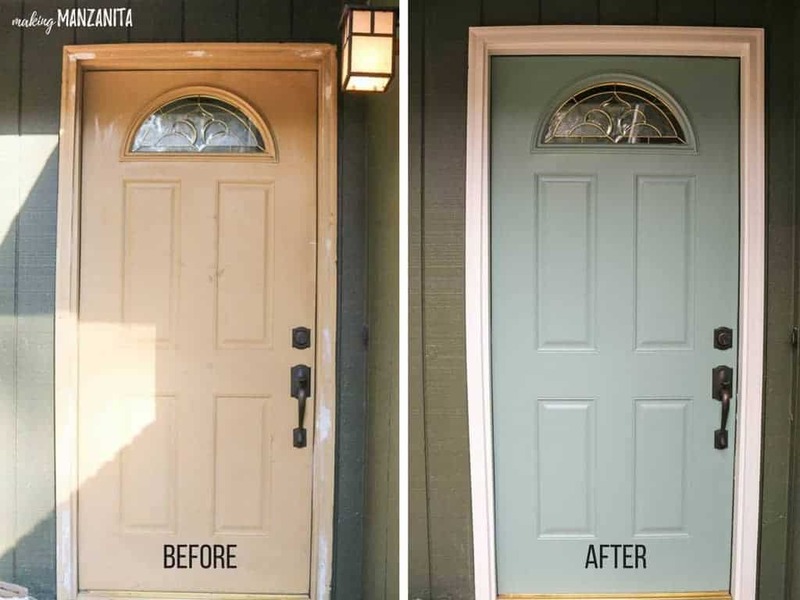 We knew when we moved into our first fixer upper that we would definitely need to do some things to improve our curb appeal. 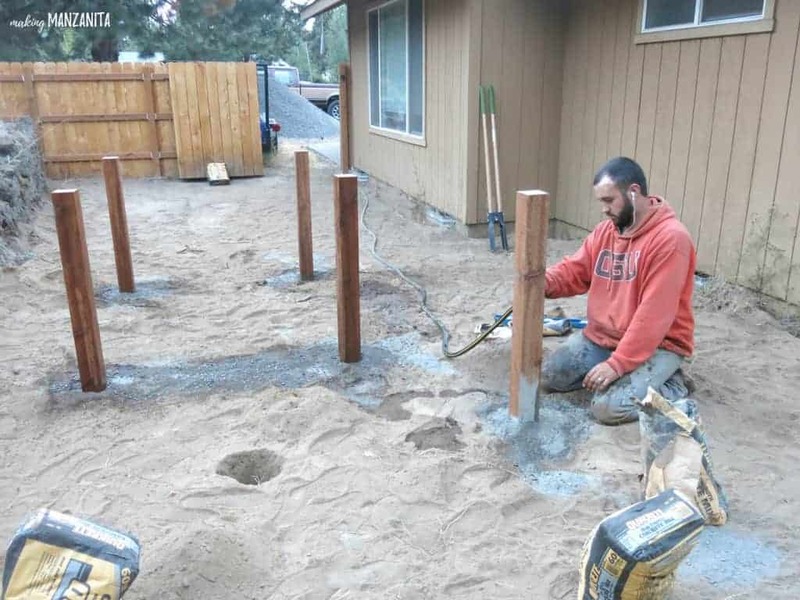 Unfortunately a lot of those projects were bigger and had to be put off for a while because we had limited time and money for exterior renovations. Ugh…. yuck. 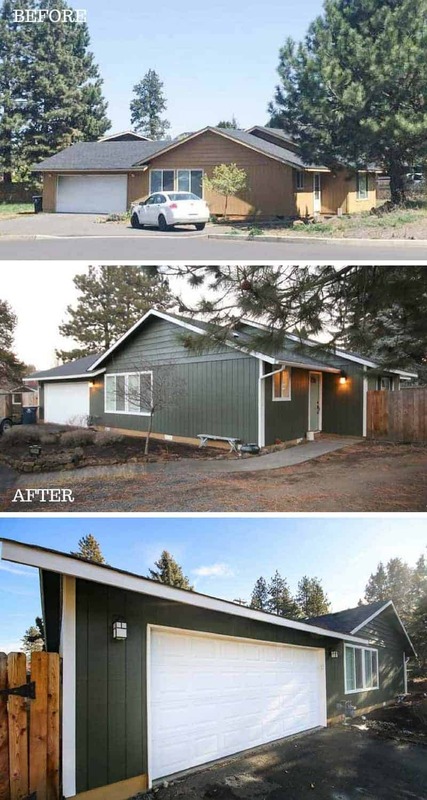 I still can’t believe how long we kept that horrible exterior paint color! 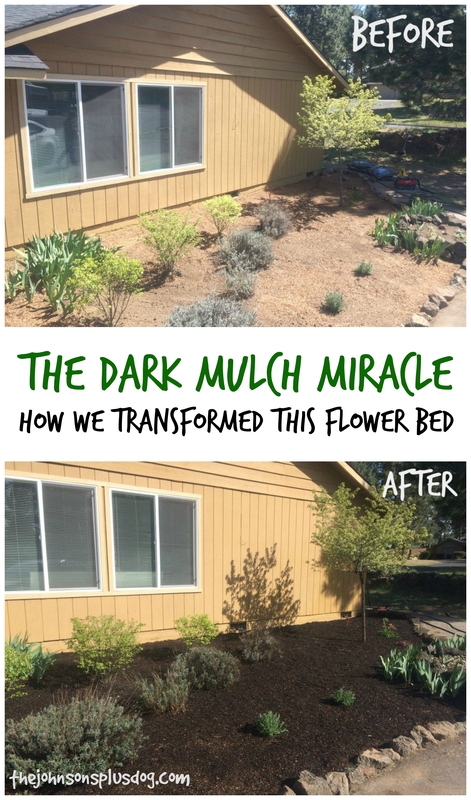 One of the first things we did outside was give the front flower bed a little makeover with dark mulch. This was really as simple as adding some dark mulch and adding some new plants. 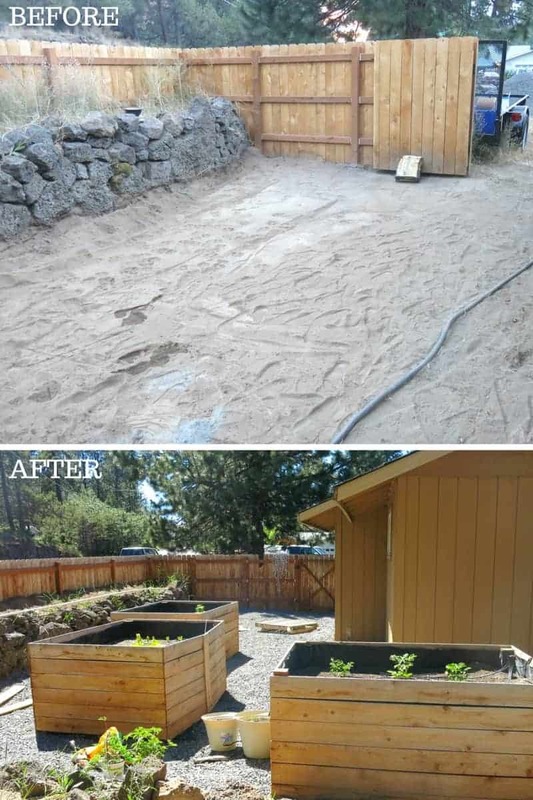 The dark mulch really makes a huge difference, right?! 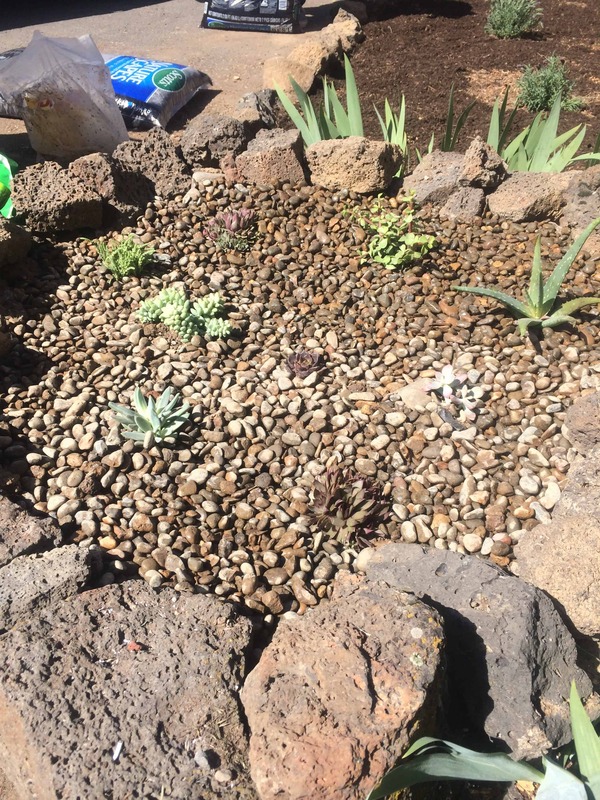 Next, I planted some cute little succulents in one of the front flower beds too. Read more about how to plant succulents here. If you’re wondering how those lasted through our harsh winters here in Central Oregon, the chicks and hens were the best. They were the only ones that survived being covered in snow for months (they actually lasted three winters!). 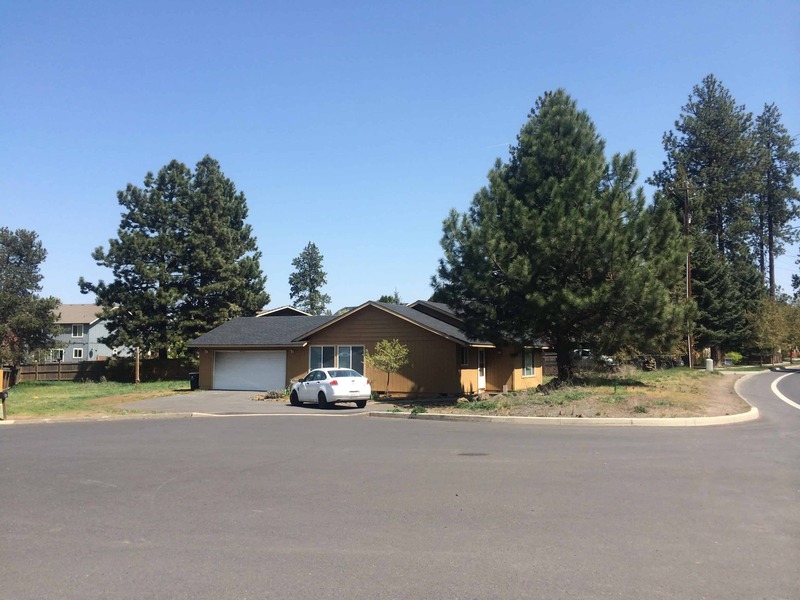 When we started thinking about our landscaping plans at the new house, we did a lot of research on high desert landscaping to make sure we were choosing plants and trees that were right for our climate. 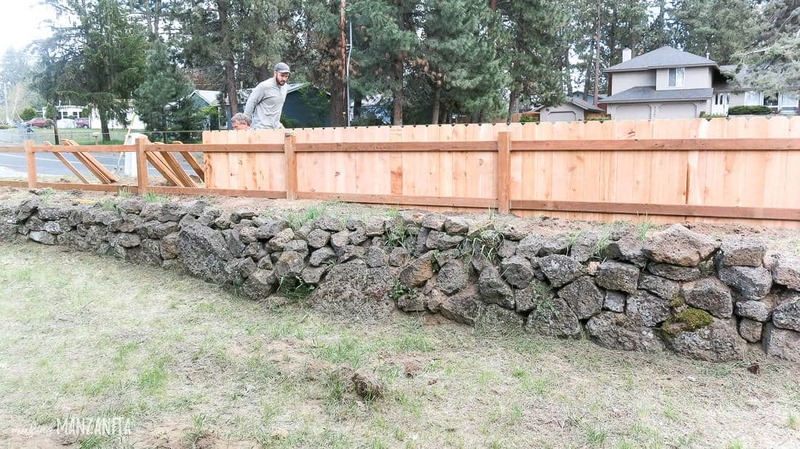 Even though we never ended up blogging about it, the next thing we did (and by that I totally mean Logan because I was mostly out of town for this project) was build a fence on the left side of the house. 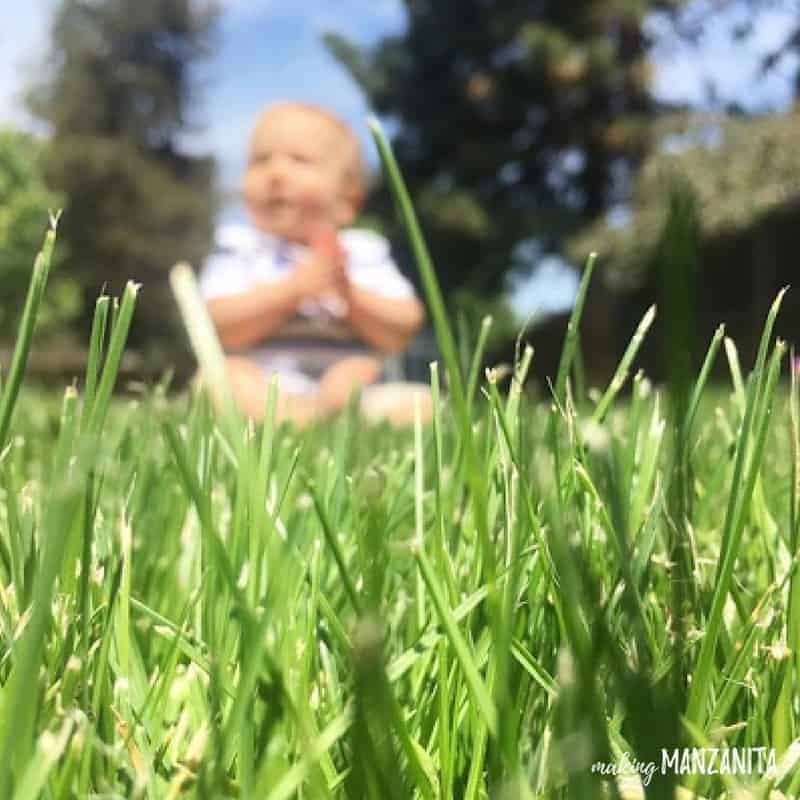 This was necessary to keep Gannon contained….and to our hide our big, ugly backyard which was just a field of weeds at the time. 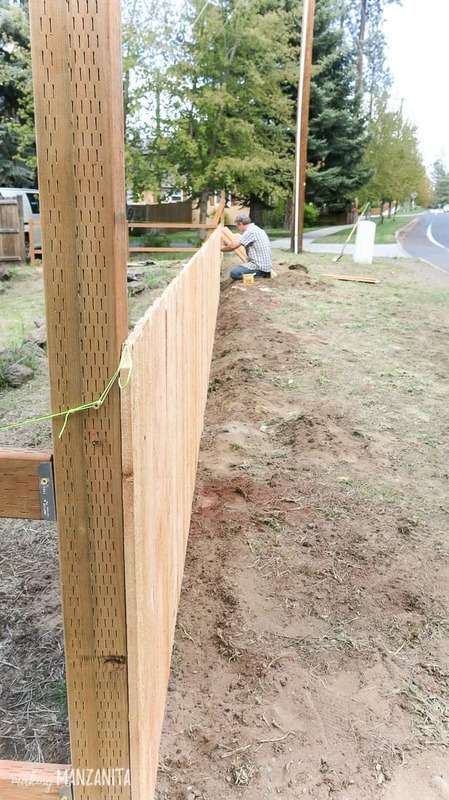 Then right before our son was born, Logan and his dad built the other half of the fence on the right side of the house. These pictures are on my actual due date! 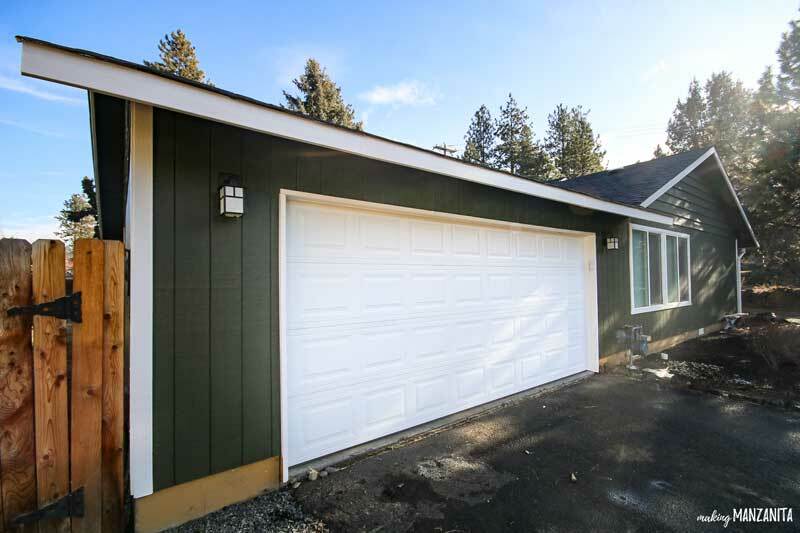 The biggest transformation we saw during all of the before and after home renovations was definitely painting the exterior of our home. 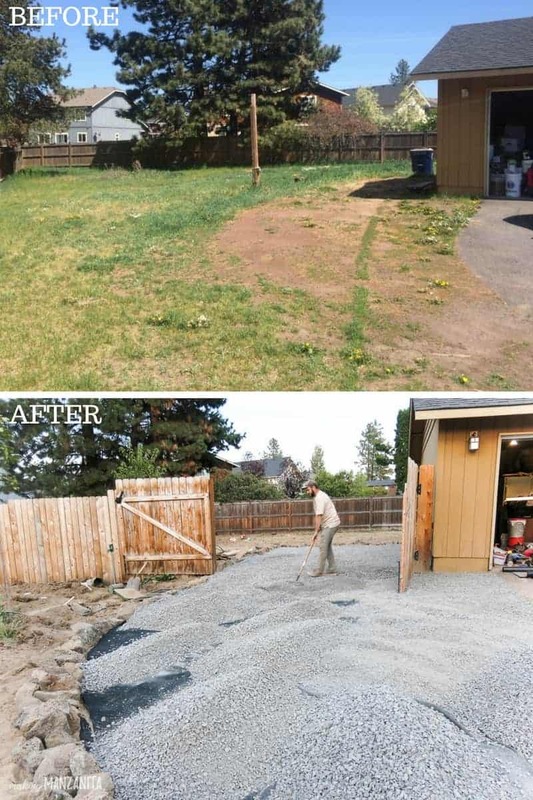 Now let’s move on and talk about all the improvements we made on the backyard. 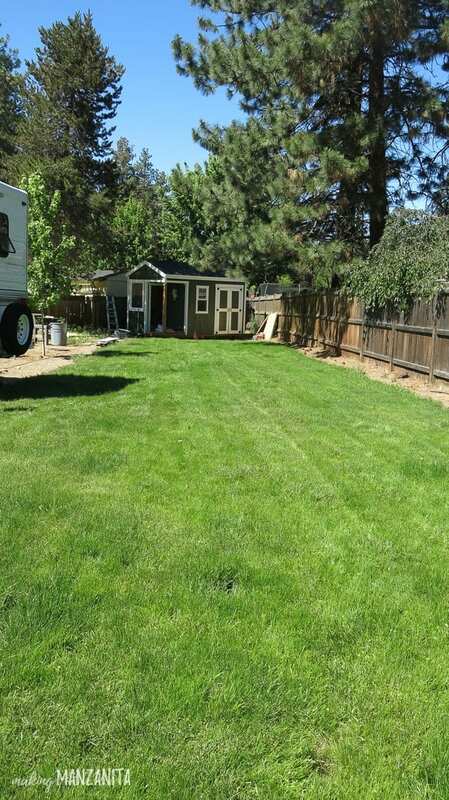 When we moved in, the backyard was a big field of weeds. 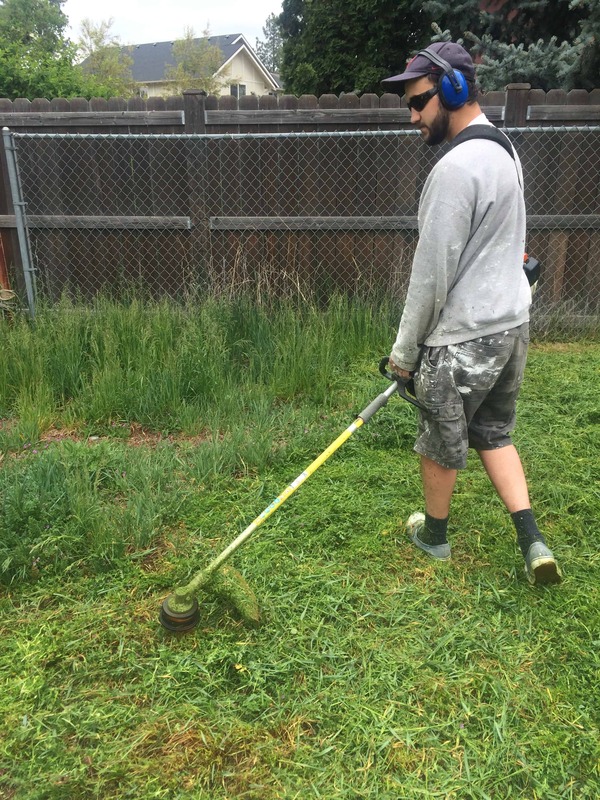 We quickly realized that even weeds had to be maintained! Logan seemed like he was out there all the time with the weed wacker just trying prevent it from becoming too crazy. 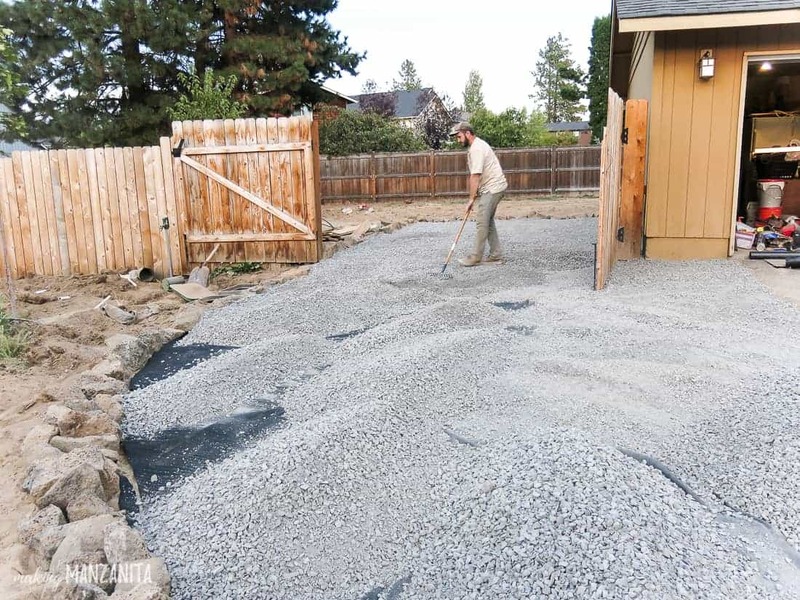 We did add a paver patio on a portion of the yard. This was ALOT of work, but totally worth it. We added a couple of trees (one to the backyard and one to the front). 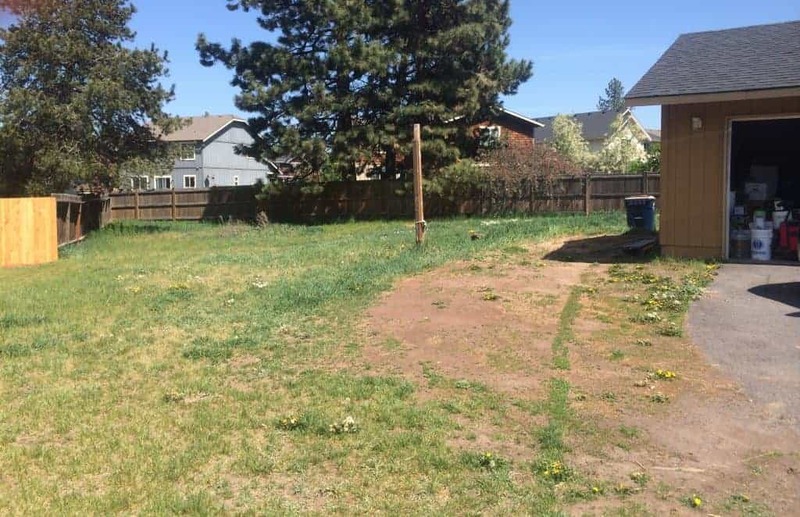 We planted our own grass, which was eventually almost ruined a year later when we got a Caterpillar to rip out all of the weeds and level everything in the backyard out. 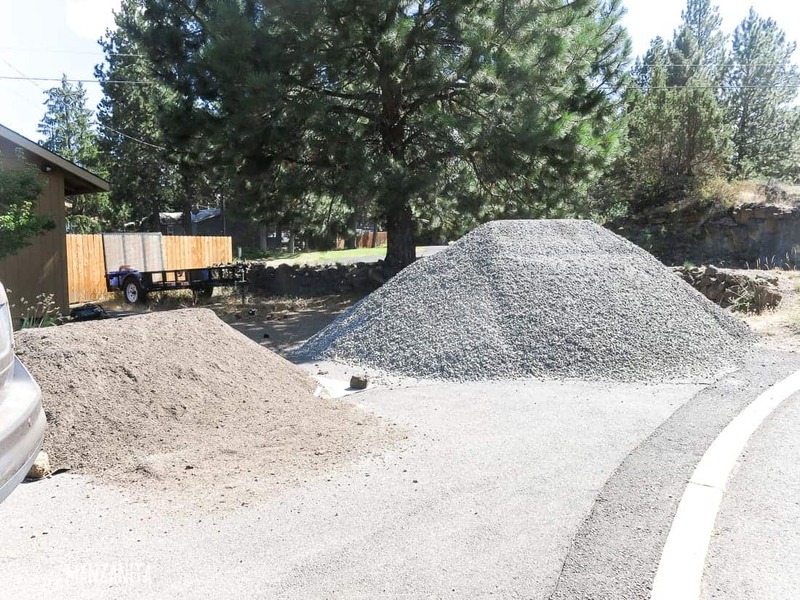 We had about 8 cubic yards of gravel delivered that weekend!! 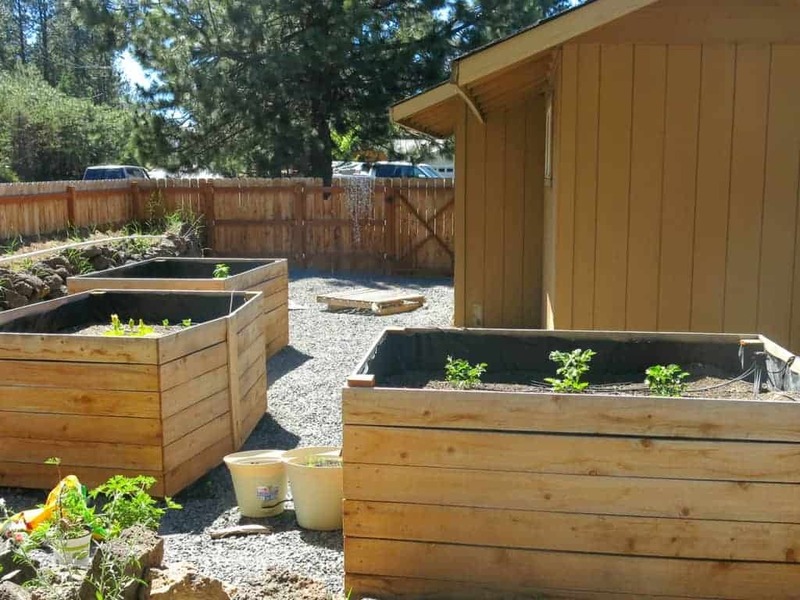 On the side of the house we got started by building three raised garden beds with cedar fence boards. 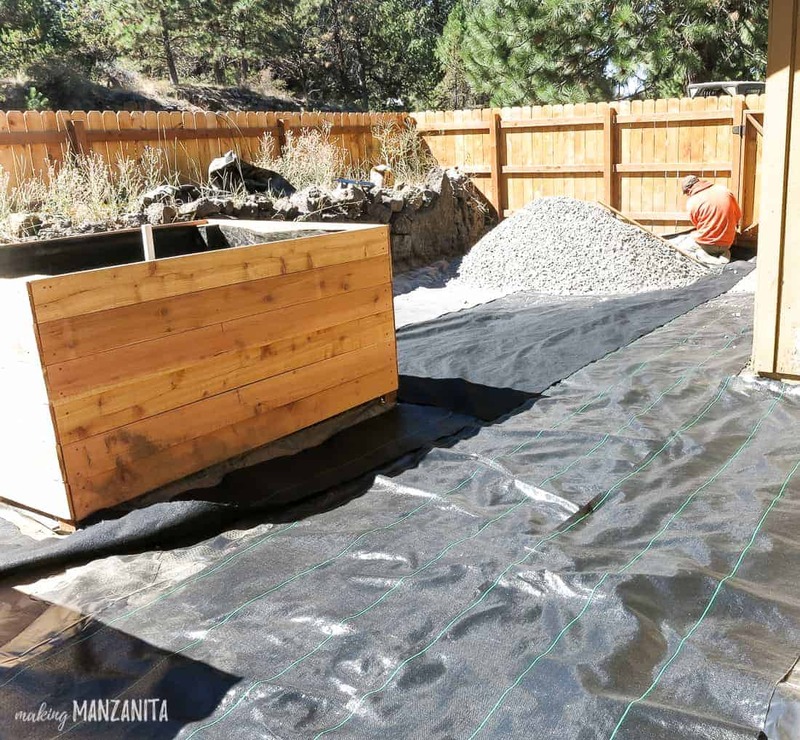 We then added a black tarp and landscape fabric to the ground and then covered it with gravel around the garden beds and in the back of the house. 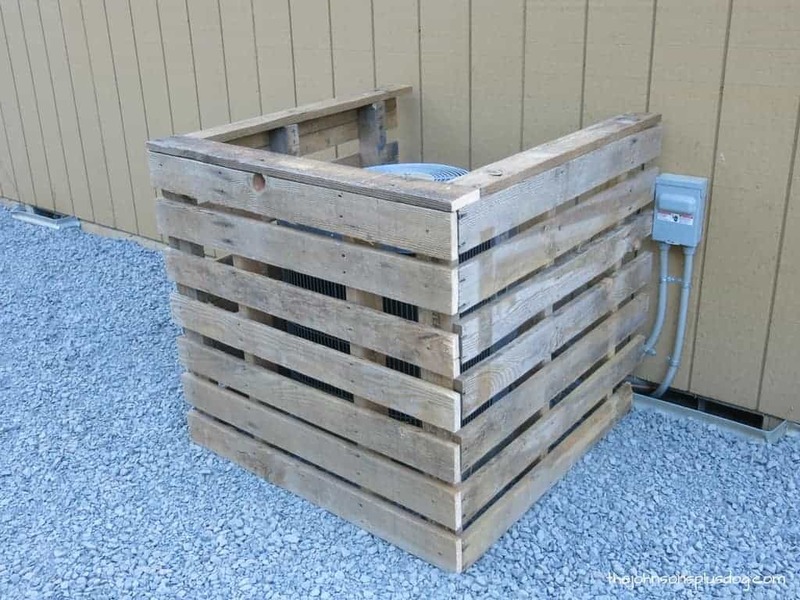 We gave our air conditioning unit a little makeover with a pallet wood AC cover. 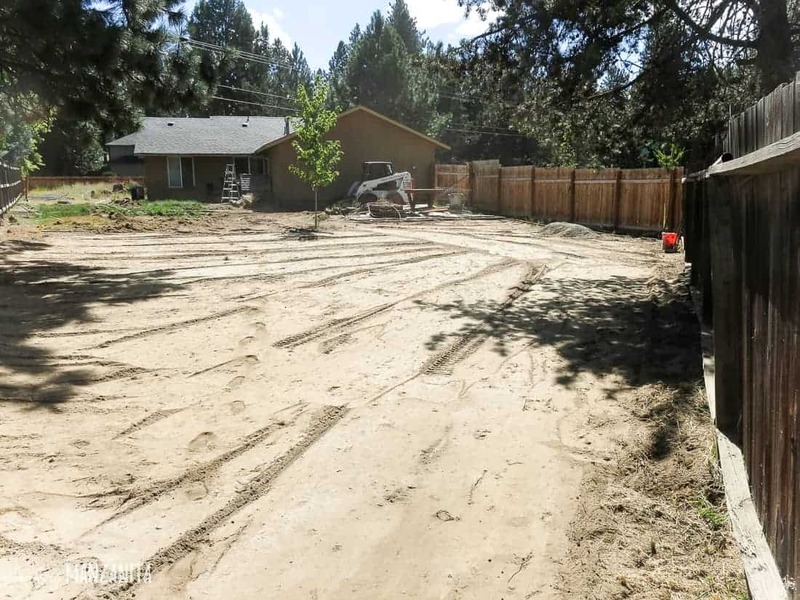 We also made a more defined driveway on the opposite side of the house. We also installed our own sprinkler system. Boy was that a lot of work! But totally worth it because we saved thousands of dollars by doing it ourselves. 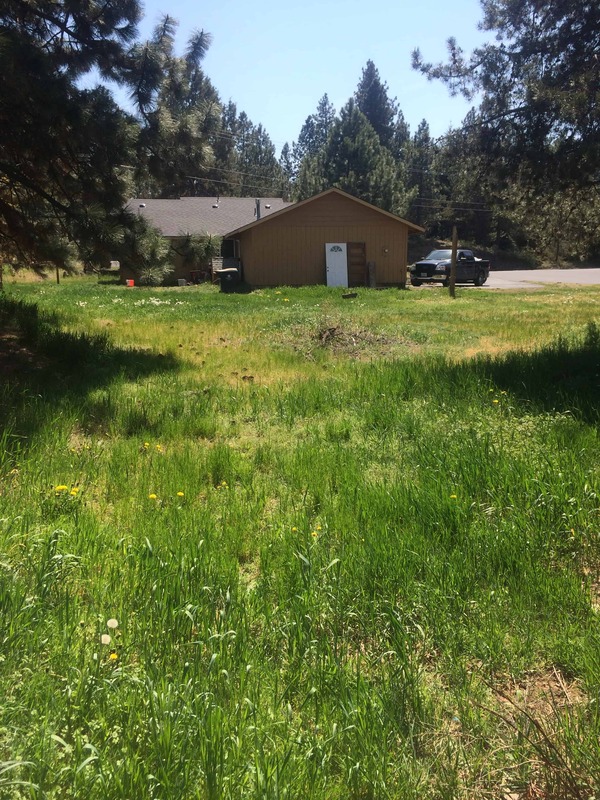 Read about the planning portion of sprinklers here and the actual installation of the sprinkler system here. 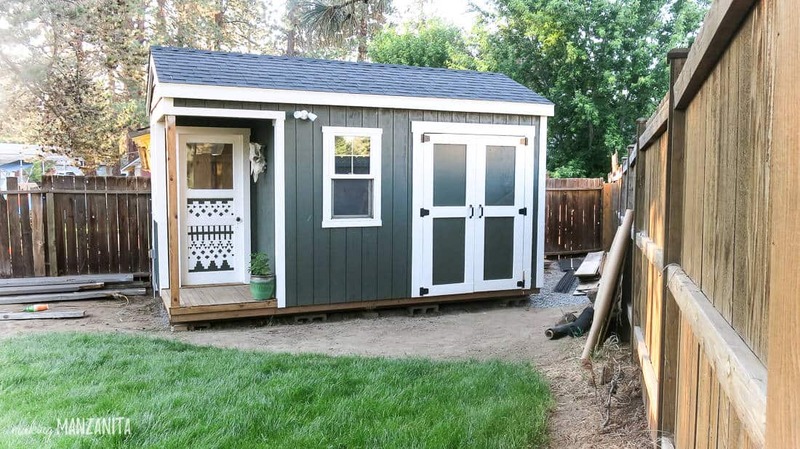 One of the last projects we did in our backyard was build this shed, which again we never ended up talking about here on the blog! Logan built it using a lot of reclaimed materials to save money. 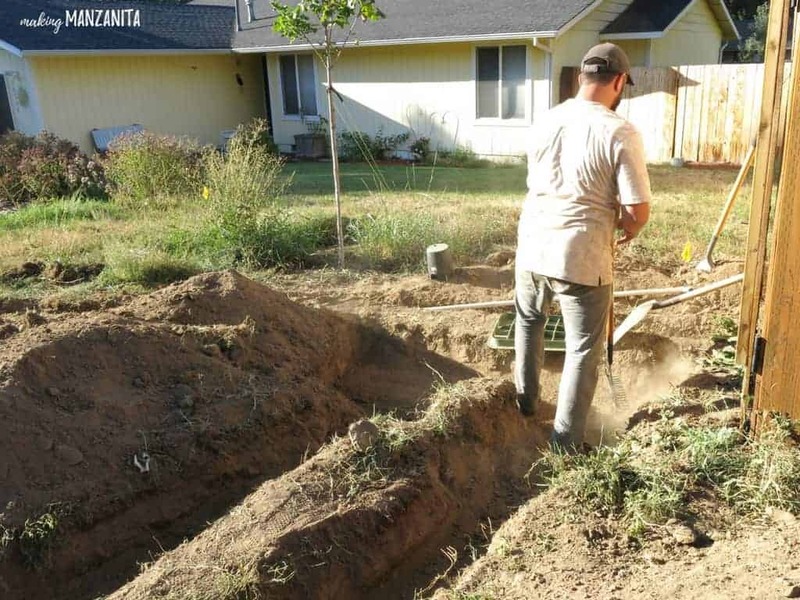 He found a lot of free (or really cheap) building materials from Craigslist, but you would never guess by looking at it. 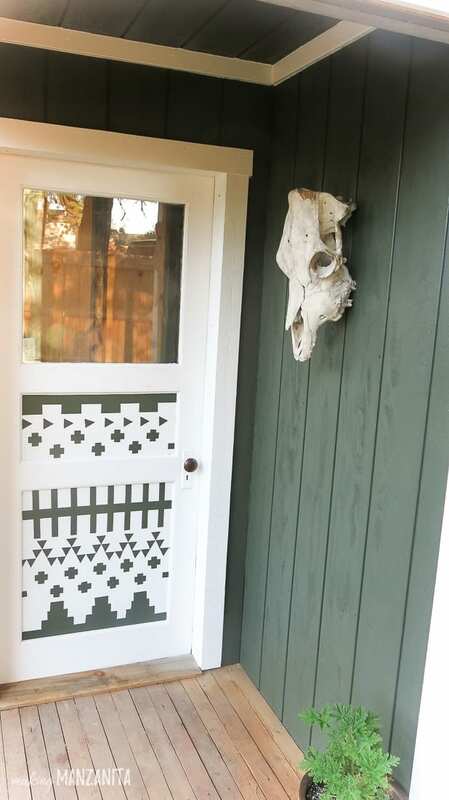 My favorite part of the shed was the door, which I gave a little boho paint makeover to. Didn’t it turn out so cute?! I also love the skull I found at a flea market. Now back at the front of the house, let’s a take a look at the entry way, which includes our front door. 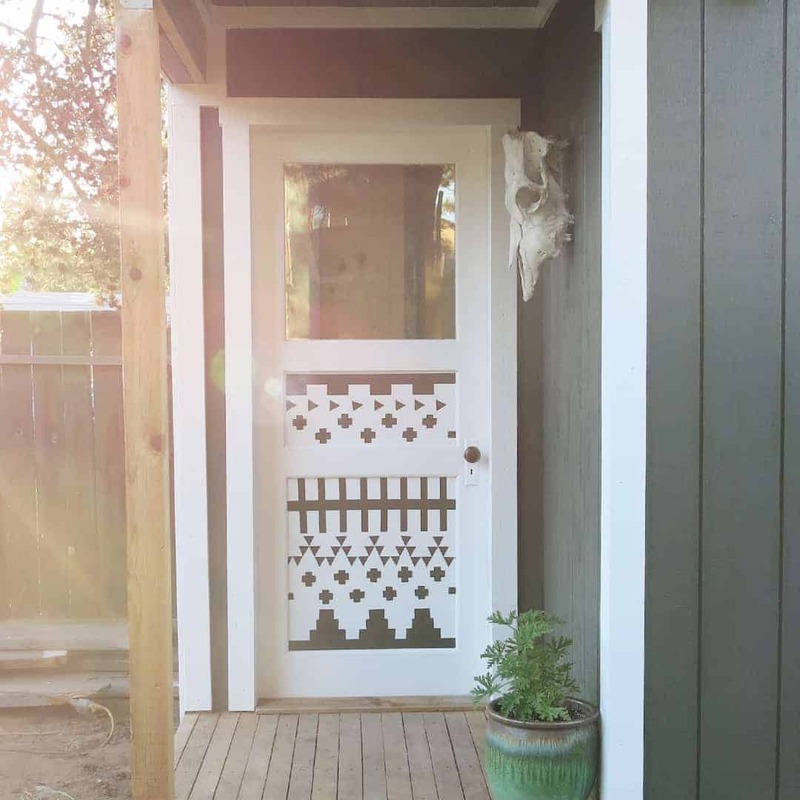 The front door got a big makeover when we did our exterior painting. You’ll also notice that we removed the screen door. We pretty much did this right after we moved in…I hated it!! 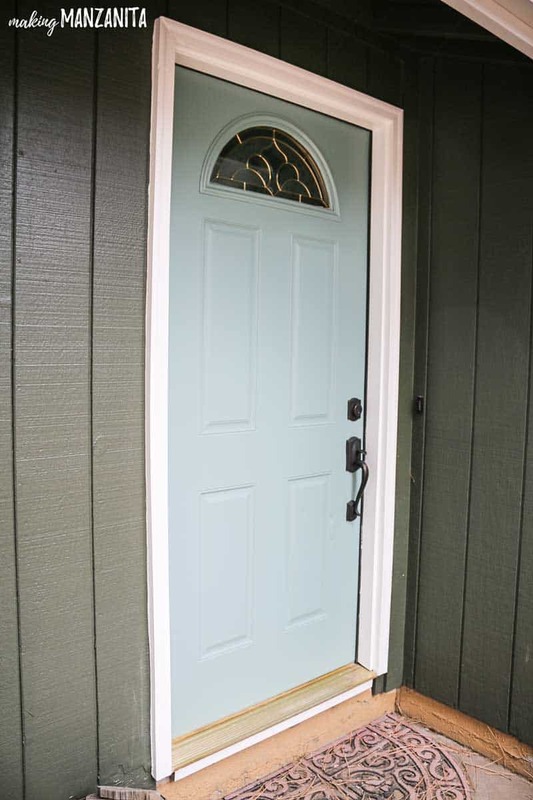 Read more about how we chose the front door color (which by the way is In The Moment by Behr)and how to paint a door here. 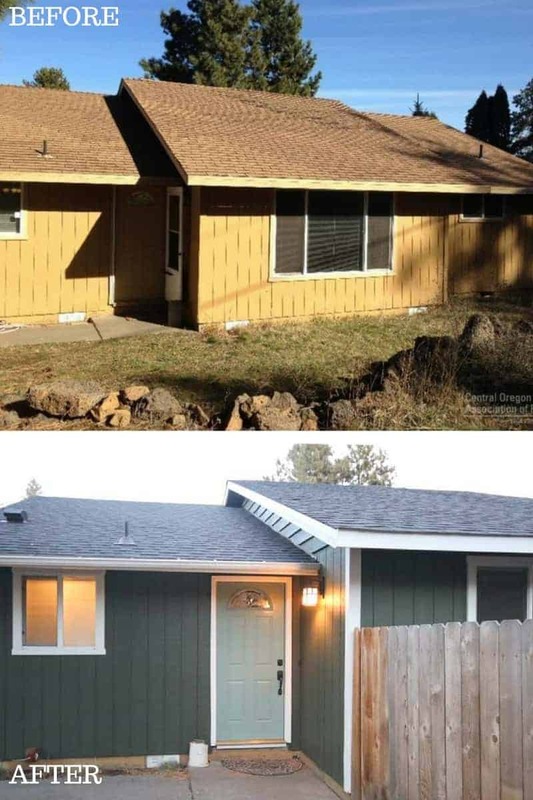 I’m telling you, looking at before and after photos is the one of the most rewarding parts of a house makeover. Our exterior came SUCH a long way in the few short years we were living there and renovating. Let’s take a quick closer look at these before and after pictures to really see the dramatic transformation of our house makeover. Stay tuned for later this week when we take a tour of the amazing interior transformation from our house makeover of our first fixer upper! You’ll get to take a look to see what’s on the other side of the front door! 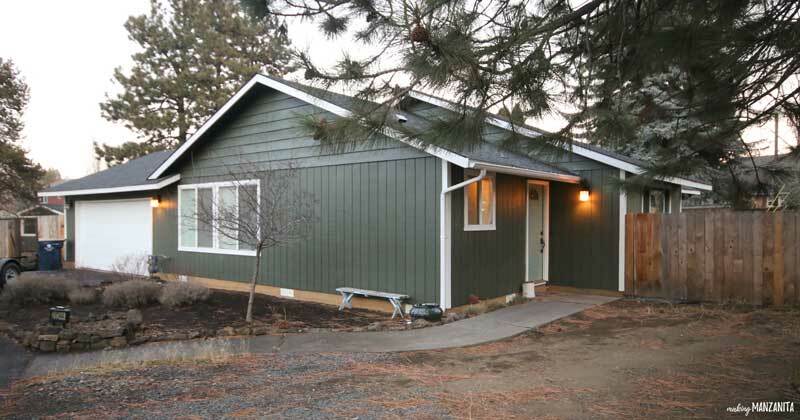 Looking for more info on our exterior house makeover?